The launched coincided with the 21st Philippine Hot Air Balloon Fiesta in Clark, Pampanga. This annual festival of hot air balloons participated by both local and foreign hot air balloon enthusiast is a much awaited annual event. It also features aerobatic exhibitions, radio-controlled aircraft flying, paragliding, skydiving, and other ground activities. Selected media friends were invited to the event not only to enjoy the hot air balloon show but also to test iKlips Duo+. They were encouraged to take as many photos as they can using Apple devices and transfer files to the OTG storage. Adam elements has a line of award-winning OTG flash drives in a range of styles, colors, and capacities. 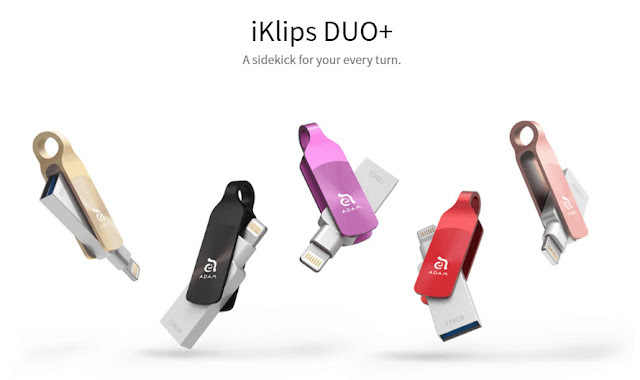 Featured in the launch are the iKlips Duo and iKlips Duo+ line specifically made for the iOS and Mac market. These portable storage devices allow you to view photos and documents, and playback music, TV series, and movies, with AirPlay support. You can use the iKlips Duo and iKlips Duo+ to back up and manage your files effortlessly, making it easy to share photos among friends after an epic trip. The units have Facebook, Instagram, and YouTube integration as well, and a new Power Sort and Search feature, among others. And since there’s no need for Internet access when transferring files, your data remains safe and secure as it is never sent through third party servers. Apart from mobile storage devices, Adam elements launched its Apple MFi certified PeAk Cable line made for iPhone, iPod, and iPad. They come in an array of premium colors that complement the sleekness of your Apple devices. They also work with your device’s case just as well, so you never have to take it off. PeAk lightning cables are made of high quality nylon fiber with metallic braiding, making them resistant to bending and not easily tangled. 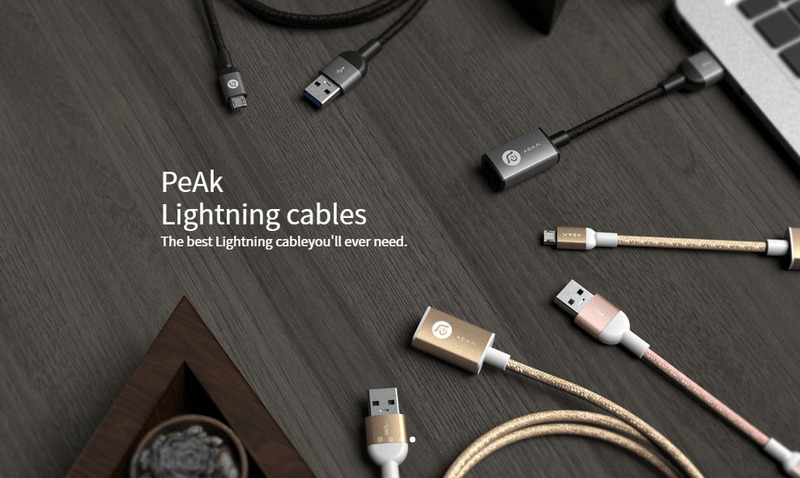 The precision cut aluminum connector-shells meanwhile make the PeAk more durable and sturdier than normal lightning cables. In fact, they’re seriously that tough that a one-year warranty is being offered, allowing patrons to get a free replacement should the PeAk cable break. Completing Adam elements’ roster is the CASA USB Type-C line of cables and adapters perfect for the new MacBook, Chromebook Pixel 2, and the standards of tomorrow. The revolutionary USB Type-C is reversible and supports speeds for quick content transfers on a plug-and-play basis ─ less hassle, more productivity. The CASA series is built with premium materials and precision engineering, making it great for everyday use and fully compatible to the latest USB Type-C laptops and devices. There’s an extra-long CASA sync and charging cable; an adapter for an external VGA display or projector suited for presentations or extending your desktop to a two-screen setup; and an HDMI adapter to get your sports, movies, music, and TV on an even bigger screen, perfect for sharing experiences. Established in December 2013, Adam elements carries innovative solutions, including health management products. It has the BF1 Body Fat Analyzer, a digital scale that gives accurate weight readings and information on your body mass index, body fat, muscle, and bone mass, body water, and basal metabolic rate. The BP1 Blood Pressure Monitor is a smart, portable blood pressure monitor, while the EF1 Infrared Ear & Forehead Thermometer is a digital body temperature thermometer that gives intelligent alerts, personal reminders, and easy-to-read charts for visualizations of body temperature trends. All three devices connect to the free GoHealthy mobile app that will help you get on the right track to a healthier lifestyle. “Adam elements was born to design practical solutions to modern lifestyle problems. We hope that through our exclusive partnership with Power Mac Center, the Filipino market will experience our mobile accessories designed and perfected with greater stability and a longer lifespan,” said Angela Chen, Adam elements World Wide Sales Manager. Adam elements products are now available in select Power Mac Center branches. More information may be obtained at the website <www.powermaccenter.com> or on Facebook, Twitter, and Instagram (@powermaccenter).